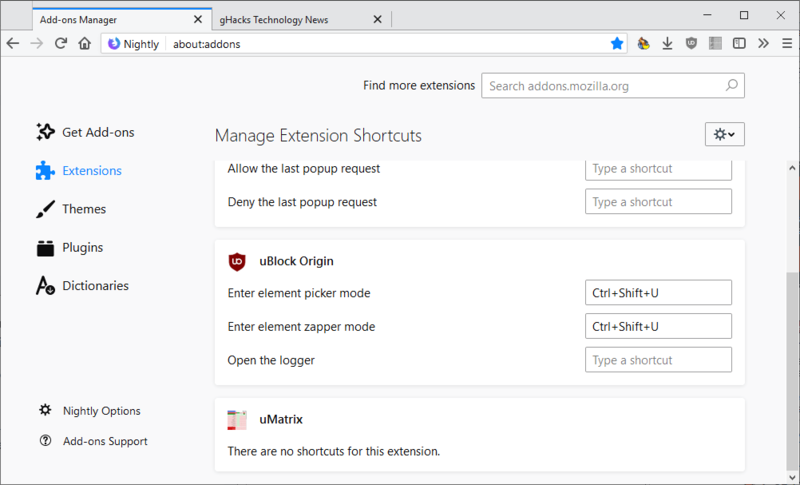 Firefox users who open about:addons in Firefox 66 may notice a new "keyboard shortcuts" link on the manage your extensions page. 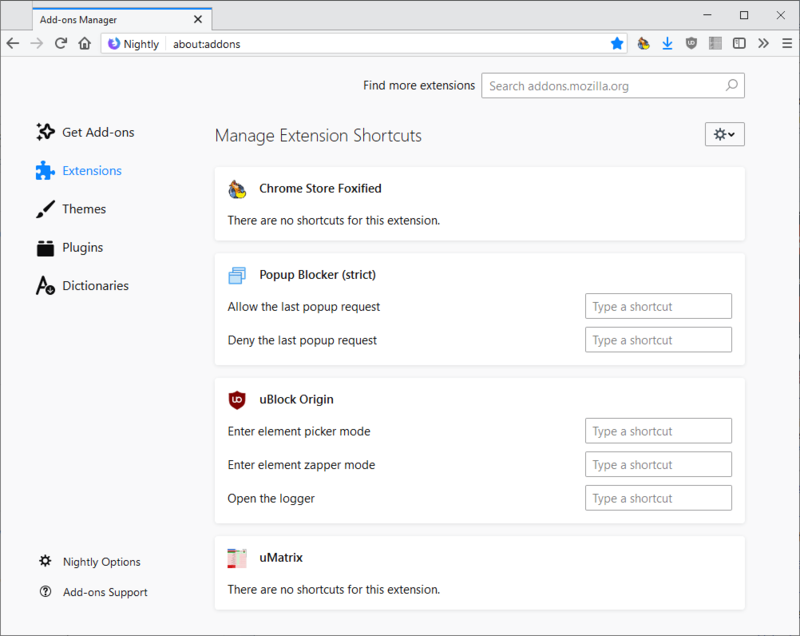 Extensions that don't support keyboard shortcuts show "there are no shortcuts for this extension" whereas extensions with keyboard shortcut functionality the functions that can be mapped to shortcuts. Each shortcut is listed with a description and the shortcut field. The popular content blocker uBlock Origin list three shortcuts: "Enter element picker mode", "Enter element zapper mode", and "Open the logger". Activate the "Type a shortcut" field to assign a keyboard shortcut to the function. Note that shortcuts need to include Ctrl or Alt, but may use other modifier keys such as Shift as well. A useful feature for those who use keyboard shortcuts. Hasn’t Chrome had this for years now? Strange that the Keyboard Link was opening Nothing at all in the “Condensed” version of the add-on manager that I enabled through the Ghacks tip a while back. 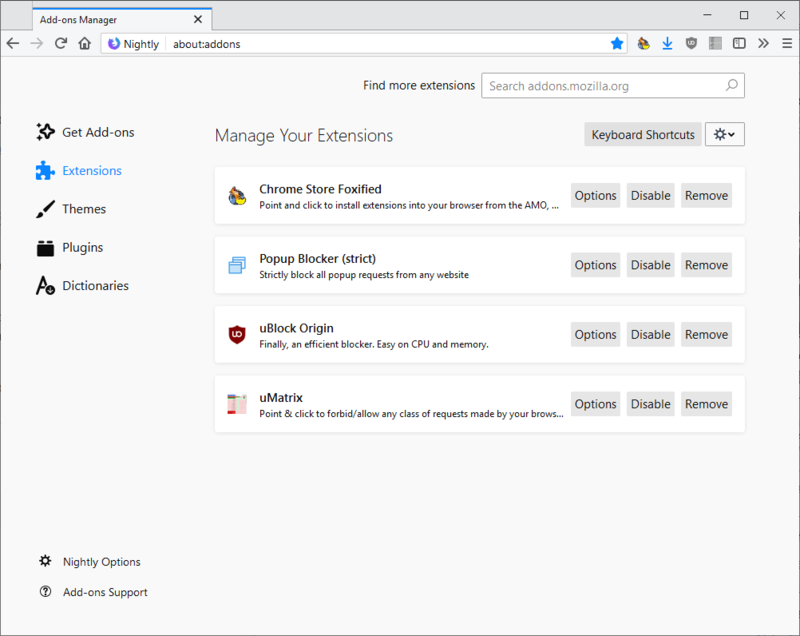 Not bad, but why they just cannot make the “Find more extensions” search column an optional alternative to searching for addons locally, which is very useful for people who have tons of extensions to manage. Good news, thank you ! in Dev Edition 66.0b3, the button has been replaced by a menu item “Manage extension shortcuts”.